IN the US movie tradition of making sure everyone, from Ohio to Nanking, understands everything, the film about the two twinkle-toed comics trudges through a long back story; Laurel and Hardy are as famous as Charlie Chaplin. Just to emphasise the point, we see audiences roaring with laughter. In familiar Hollywood style, their manager, the Mussolini-loving Hal Roach, is cheating them. 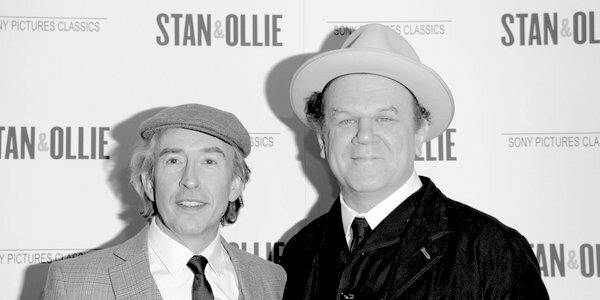 Stan Laurel, an exercise in dignified pathos from Steve Coogan, wants to set up an independent film company, dreaming of making a film based on Robin Hood, but cannot persuade timid Ollie Hardy to break away. It’s hard to imagine Ollie, played with great sympathy by American, John C Reilly, going anywhere as he’s so coated in blubber. Under all the plastic fat he had to wear a surgeon’s cooling suit. The end credits show there were even ‘prosthetic silicone runners’ employed to carry his fat about. Robin Hood would have had ‘sad violin music’. It was never made, but this film makes up for it with plinkety-plonk piano to tell us we are seeing something amusing and soaring violins for sadness. Stan is fired by Roach. Ollie makes a film without him, partnered by an elephant. We catch up with them sixteen years later, in 1953, still together but out of fashion, eclipsed by Abbott and Costello in the US. Stan, originally from Lancashire, insists on a tour of post-war Britain, thirteen shows a week in small English towns. This time they are in the clutches of Bernard Delfont, who is portrayed as ruthless and preoccupied with promoting Norman Wisdom. All very predictable, if not tame, which is a surprise as Coogan is a self-styled radical comedian, and director Jon S Baird previously produced Filth, based on a brutal black comedy by the controversial Scots novelist Irvine Welsh. The film reflects current trends rather than the culture of the 1930s or 50s; it has to be miserable. These days weight is given to misery, not to the lightly comic. Irony is not an internationally saleable commodity. This means some of the truth about the men and their times is lost. The BBC occasionally shows clips from that post-war tour where ration-weary Brits flocked to railway stations to meet Stan and Ollie. They were remarkably charming and funny as they entertained crowds, unrehearsed. In this film they are a mirthless couple. It accidentally comes to life only when the wives turn up. The gifted Scots actress Shirley Henderson plays Lucille, Hardy’s Texan third spouse. She doesn’t attempt a US accent, but is appealing as a wife who sees her husband dying before her eyes. Stan’s blonde, bumptious fourth wife, Ida Kitaeva, played by Nina Arianda, resembles a bejewelled Russian hamster. They spark off each other brilliantly. Delfont comments that with them around you get ‘two double acts for the price of one’. Their animosity and frustration are more interesting than the men’s gloomy self-absorption, perhaps because their roles were treated less reverently. ‘We got some shows to do,’ are their final words as they waddle off bravely to finish their agonising UK tour. As a sweet, sentimental film based on modern ideas about male friendship the film will entertain many, but as an honest portrait of great entertainers in a different age, it’s a missed opportunity. Previous articleWhat will happen to the Tory traitors?